It can be intimidating to book a cruise in another country, much less another continent. 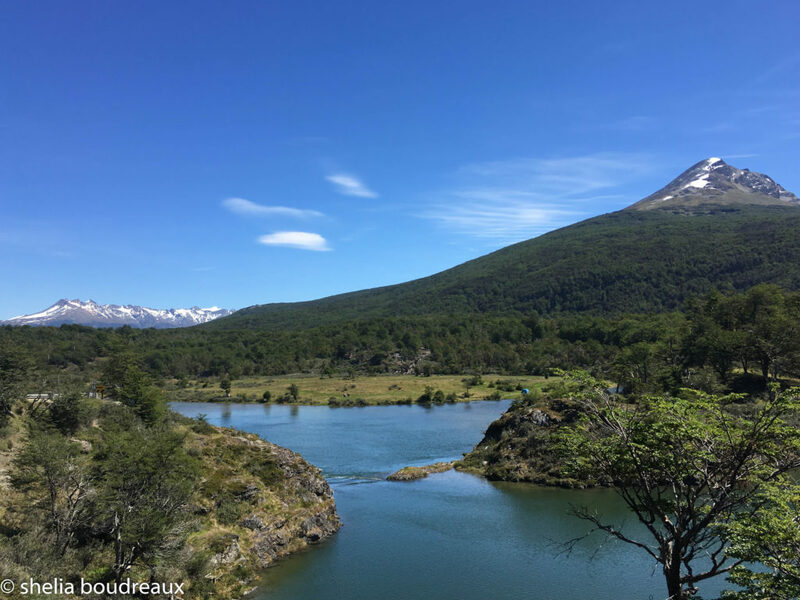 We just got back from our South American Cruise and I have written up our experiences in each port to help your trip be a little less hectic and hopefully save you time and money. Where are my South American Cruise Tips and Review, including things you may want to know before going. As you may know, we spend Thanksgiving/my birthday somewhere in South America. I am almost done with the entire continent and could go back to many of the places over and over. Some places I am good with seeing just once. This year we decided, after much deliberation, on taking a cruise from Chile around the bottom and up to Buenos Aires. We researched driving or flying and I really wanted to go to the Falkland Islands to see the penguins there. 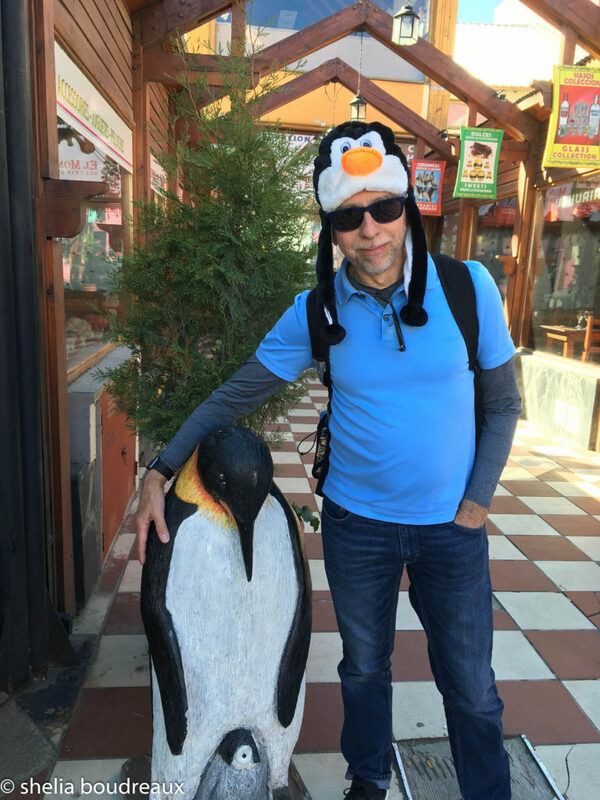 Yes, penguins are all over South America, but I have always wanted to go to Stanley. You cannot easily get there without a ship excursion. Plus, flying around South America on limited vacation time was not appealing. It just so happened there was a great itinerary from NCL for 14 days (you can’t really do this in a shorter time) around Thanksgiving, so off we went! 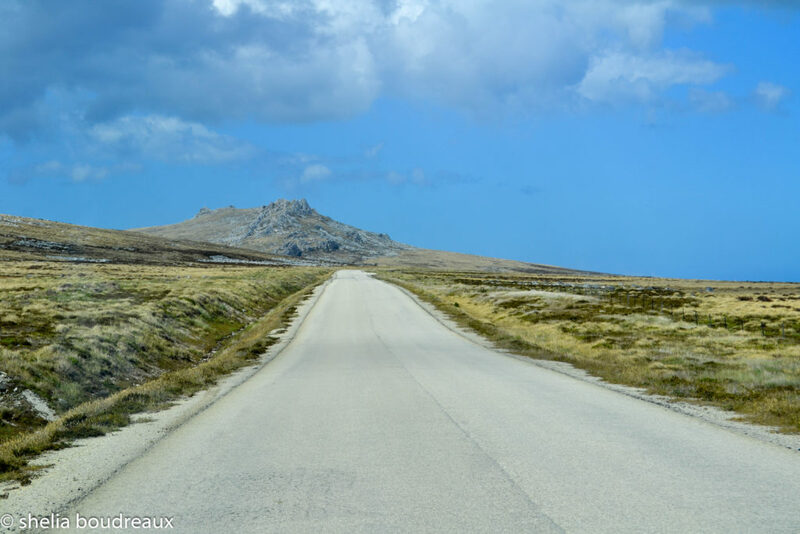 If you are not familiar with cruising, it sometimes is a little confusing as to where you are actually going verse the actual city unless you are familiar with that area. We decided to go on this cruise a month or so before the date so I did not have a lot of time to research it. Here is the thing.. Valparaiso is about a two hour cab ride from Santiago. Everyone told us it was an hour except for the hotel staff, who said two. It took us almost two hours. It is not a bad ride at all and just be prepared. So remember: if you fly into Santiago, you still need to drive two ours to get on the ship. We decided to fly in the night before our trip and stay in Santiago. We stayed at the Courtyard thinking we just needed a place to sleep and use the least amount of points. I was blown away at this hotel. The lobby is above a garage so at first we were skeptical, but that is just the set up. You walk in and it is nicer than some Renaissance that I have stayed. Definitely stay here if you are spending the night. In order to see the city we decided to take the easy hop on hop off bus. Whatever you decide to do in Santiago, DO NOT TAKE THE HOP ON BUS. Traffic is so bad in the city that there were some points where we were not moving at all. The itinerary is strange too as you basically go way out of the way for the mall and then there are a bunch of stops all close to each other. Take a cab from where ever you are into the city. The embarkation process for getting on the ship was very different than I’ve ever experienced so I want to make sure you are prepared. You arrive at the port and if needed check your bags. We only had carry on so we proceeded to the building. There we had to fill out papers stating that we were not sick. Then you queue up. Normally this is where they give you the cards, info, etc but this line they just checked identification and gave you a number. That number was your group to get on a bus. Yes, a bus. We get on the bus and it starts driving through the port. I was confused as to when we were going to be processed. The drive was literally through the port where the cargo containers are. You know on movies where they are chasing people through the cargo containers? It was weird and had I known the process probably a little less concerning. We arrived at the ship from the bus ride and then get on the ship. Um, what is happening, when are we going to be processed? We walk through inside and are ushered to the dining area where we are processed there. Because the ship moves in and out of Chilean territory the passports must be reviewed several times along the trip. They ask to keep your passports to streamline this process. My husband and I were not comfortable with this process and worked with the manager there to ensure our needs were met. She did a fabulous job at helping us with the process. If you have any doubts or concerns, talk to the manager as they are so helpful. It might help you to review the regions of Chile as we move through the different ports. This is a good guide to start. Puerto Montt is the capital of Los Lagos (The Lake) district of Chile. This district is known for .. you guessed it! .. Lakes! You will need to tender off the ship to the port (take a small boat). It is not a bad ride and they have the process pretty well organized. 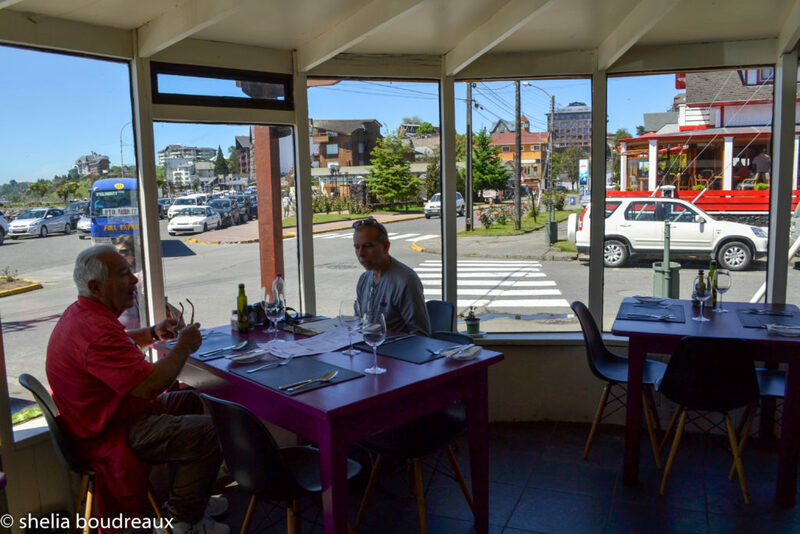 Puerto Montt is nothing more than a small city. 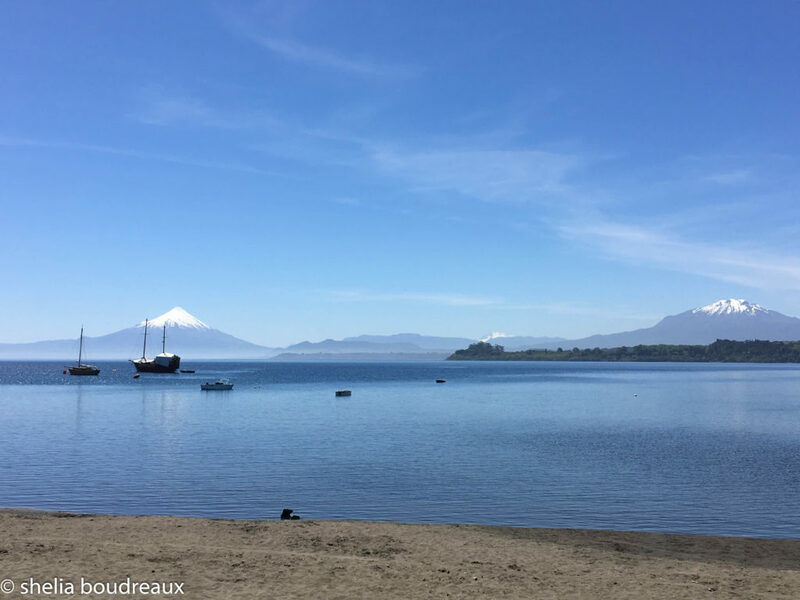 Where you really want to go is Puerto Varas, which is a short bus ride up. Walk from the pier to the bus station, which is about a 10 minute walk. You will pass a craft store if you want to buy handmade items. The bus station has a few stores for buying water and there is a toilet but you must pay. The bus is more of a large van, and there will be more locals than tourists. They will drop you off in front of the casino in Puerto Varas. I recommend taking in the sites and walking around Puerto Varas. We stopped at a restaurant for lunch and had a wonderful meal with a great view. 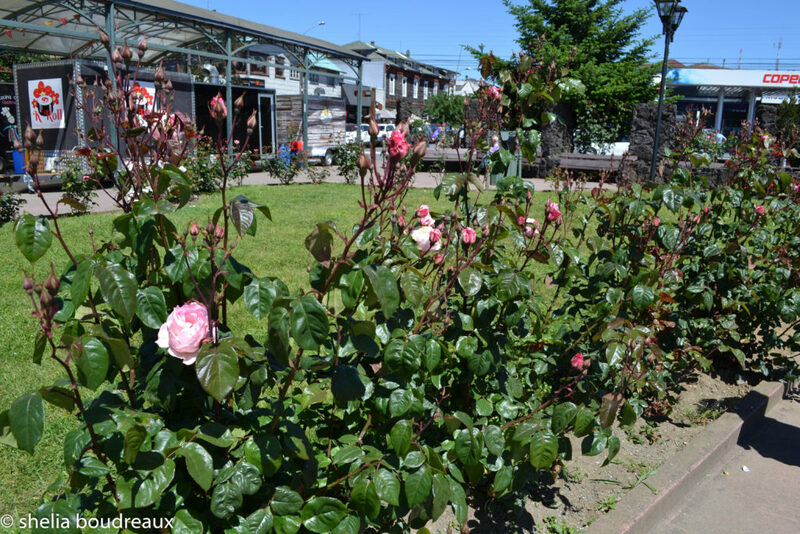 Puerto Montt is known for its beautiful roses. 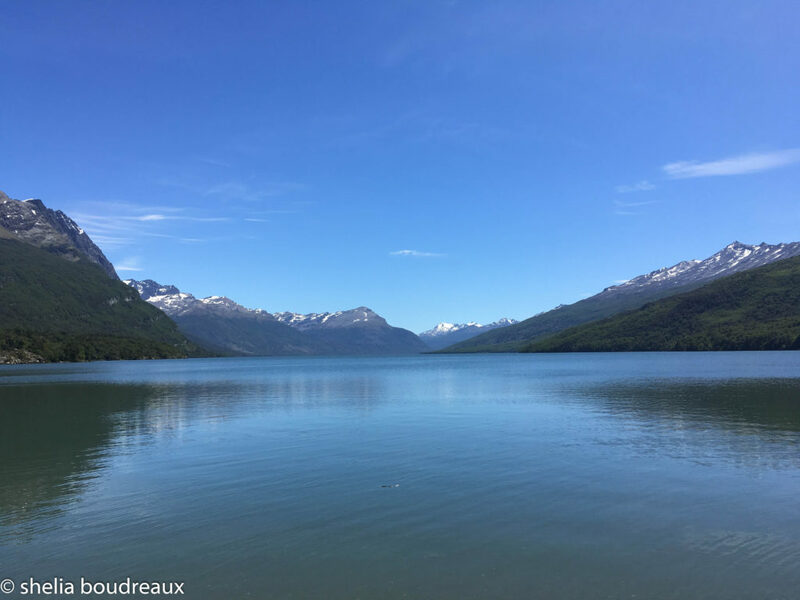 As we docked in Chacabuco I quickly realized that the rumors were true – it is magnificent. The lakes, the snow peaked Andes, it is truly nature’s gem. Many people we knew just took a car into the town of Aysen which is about 20 minutes from port. 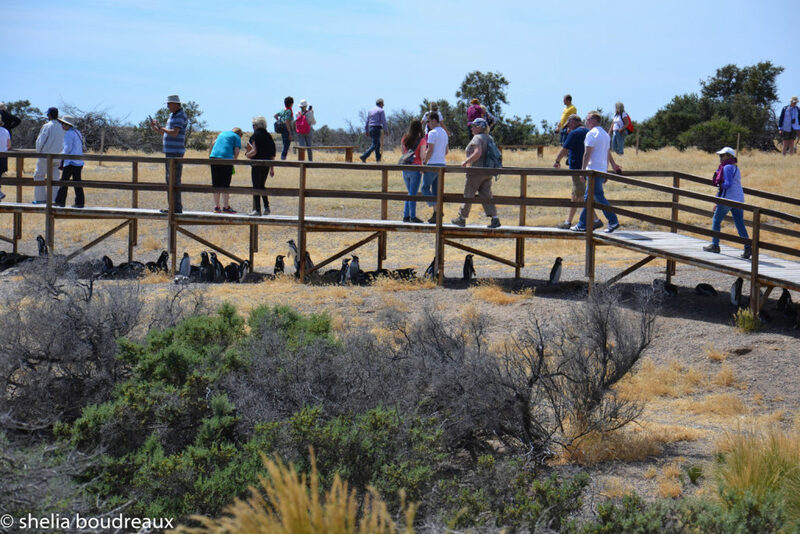 Some others went horseback riding and said it was “the most amazing scenery ever”. 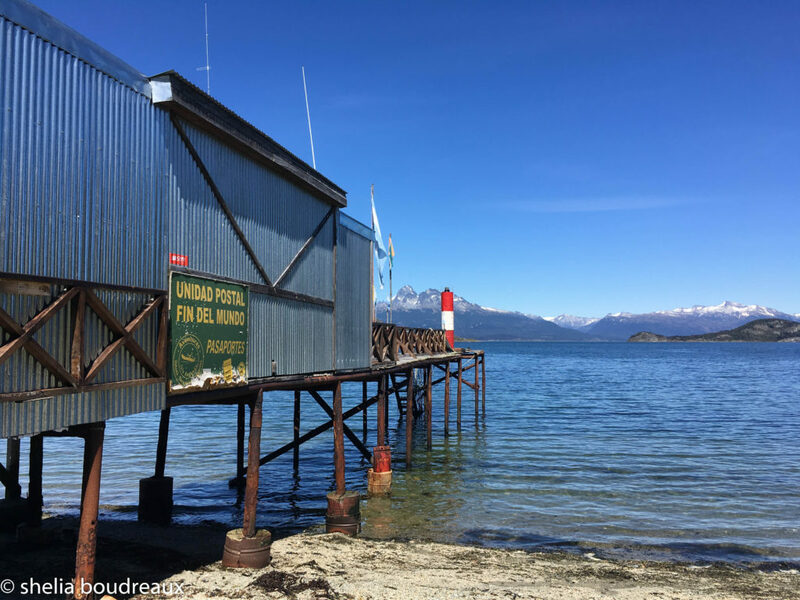 We are not much for excursions as we like to do it ourselves, but we were curious of going into the Patagonian area. It was a two hour ride and with our time limit of getting back on the boat we thought we should be safe and take the excursion. The bus ride was pretty but for two hours a bit long. We rode up to the Rio Simpson National Reserve, and the Rio Simpson, and there were so many other people that we really did not get to experience it well. There was nothing really spectacular or magical on what we saw, so I am not sure why anyone would take this tour. We stopped at a waterfall that is famous in the area for having an apparition of the Blessed Mary. Being Catholic, I thought this was odd that I hadn’t heard of this waterfall (I drag my husband to all kind of holy sites). I also thought it was odd that if Mary had appeared there would have been more than just a few candles at the site. I have spent significant time trying to find more information on it and have been unsuccessful. However, there is a waterfall near the Sanctuary of St. Sebastian that would have been interesting to see. If you do know what this waterfall is, please send me a message or put it in the comment section below. 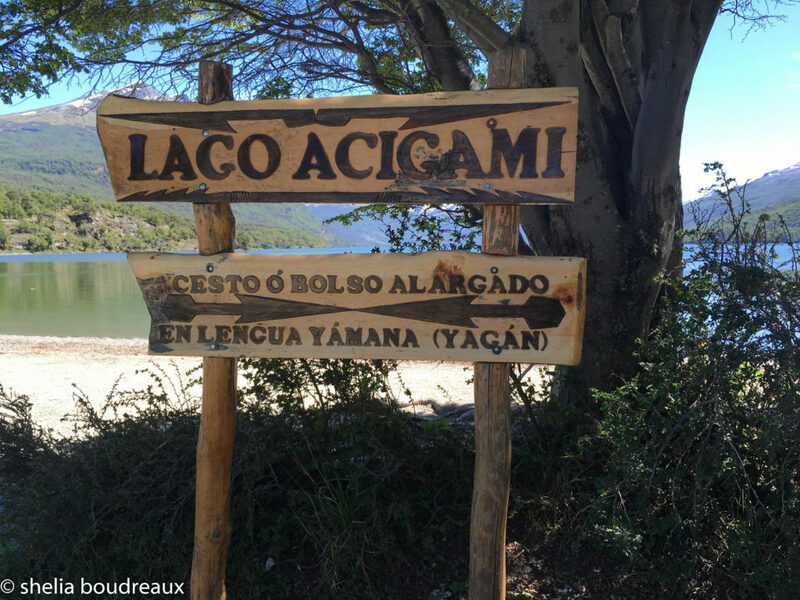 My Recommendation: Walk Around the town of Aysen. There will be cars at the port you can take. (Or do the horseback ride, but I can only recommend that based on what others said). Five ships started out sailing. One wrecked and another the crew overthrew the captain and headed back to Spain. In 1520 only three ships went through the strait. Magellan made it from Spain all the way thru South America to the Philippines. While in the Philippines, Magellan lead an attack with the locals and was killed in battle. Magellan had a slave, Enrique of Malacca, who continued the voyage around the world so that the remaining crew would accomplish their destiny. Punta Arenas has one of the best historical museums on the region. People said they spent hours in there, and I guess you could but you really only need about 1-2 hours tops. The main city has enough little shops to keep you busy. 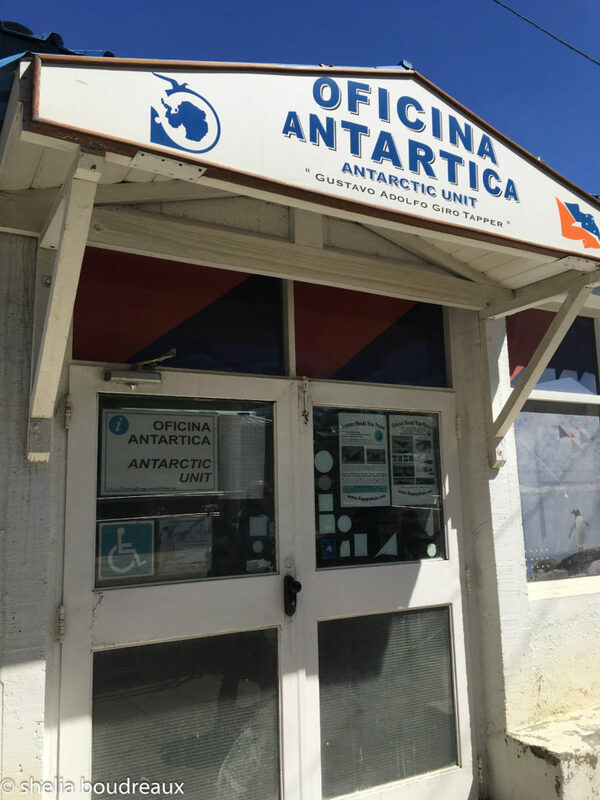 There are especially a lot of shops for Antarctica as this is one of the main points of entry to the continent. 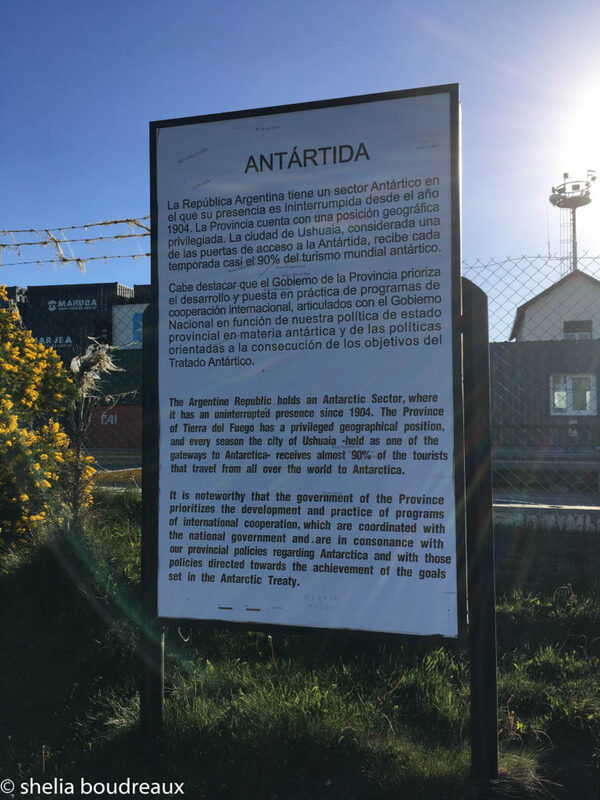 The area of Punta Arenas is the end of the South American “Continent”, meaning everything south of it is not accessible without a boat (they are islands). In 1987 Pope John Paul II visited South America, and in his honor there is a cross signifying where we preached at the “end of the earth”. You can read more about his visit here. 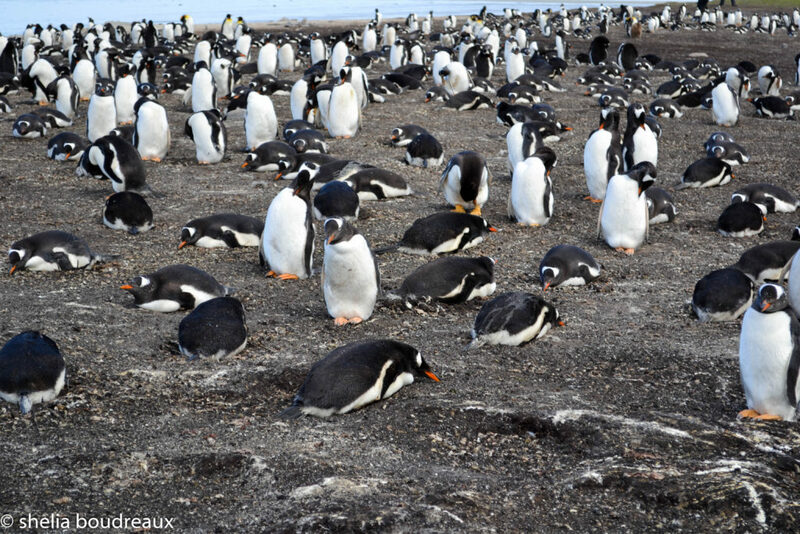 Some people went on a private excursion to see the penguins and thought it was fabulous. Please note that there have been times when people go to see the penguins and cannot get back because of the tides, so be careful. 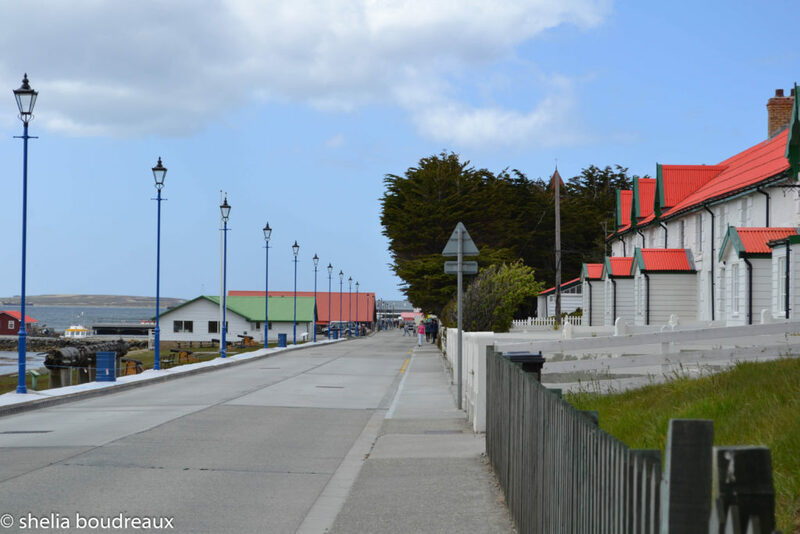 My Recommendation: Walk Around Punta Arenas. Lots of little shops and handmade crafts. Definitely go to the museum. You can see the Cross at the top of the “End of the Earth”. This spot marks the end of the South American Continent. South of this are islands. 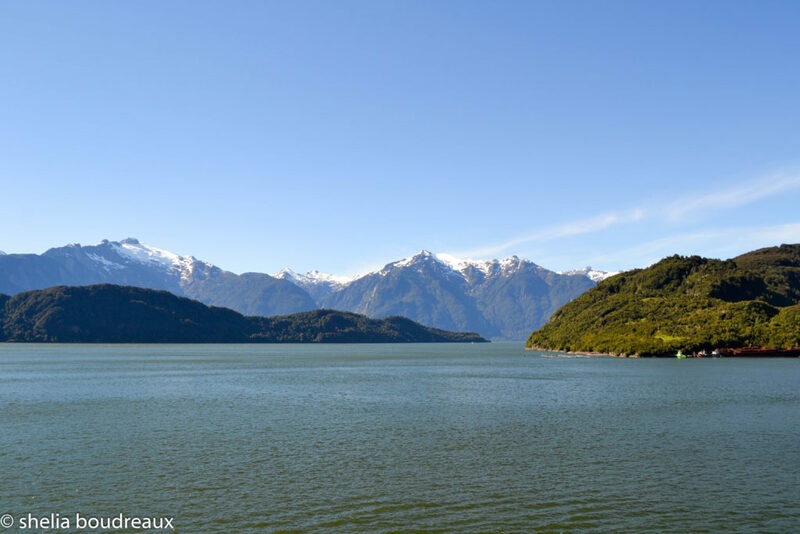 In the morning before arriving in Ushuaia, we cruised down the Beagle Channel. The Strait of Magellan runs at 53.7302° S, 70.8288° W while the Beagle Channel runs to the tip of the continent at 54.8899° S, 67.8349° W.
The body of water is named after the first ship to pass, the HM Beagle. This ship happened to have Charles Darwin onboard, as a crew member, not yet famous. 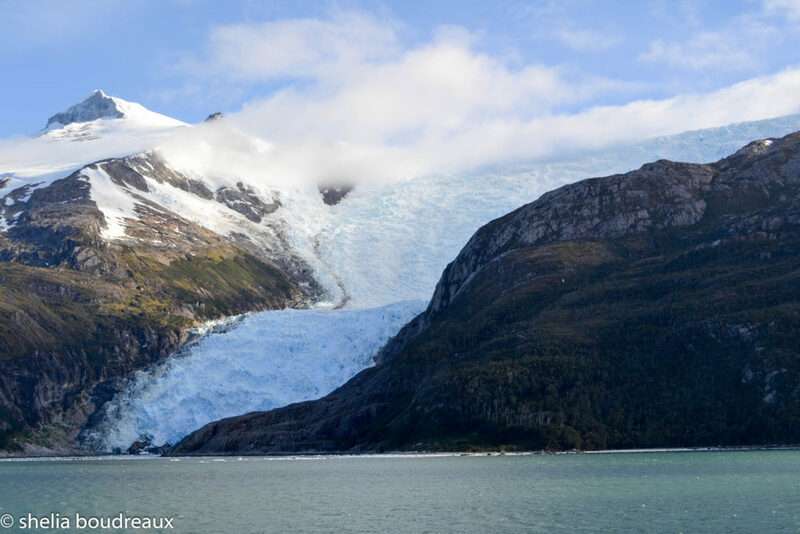 In the Beagle Channel there are five main glaciers. They are very nice to see, but you need to awaken around 6am and stand out in the cold. 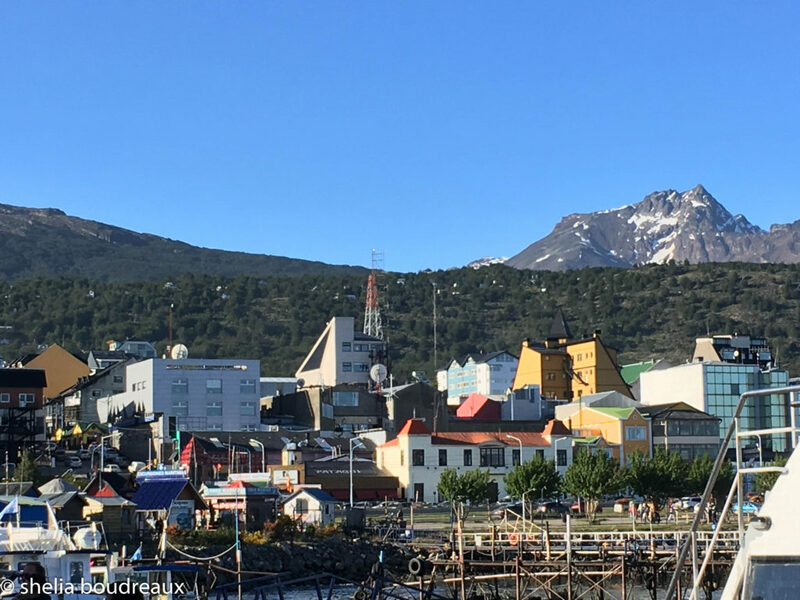 If you are taking this cruise to see the glaciers there are several groups in Ushuaia that will take you up to see one off the ship. I was surprised at how much I enjoyed Ushuaia. I would like to go back on another trip and just spend time there. As you get off the boat there are a ton of little shops where you can buy various souvenirs, candy, water, etc. Even if you do not want to go into town, this is a nice little stop. You can take your passport with you and for $2, they will stamp it with an “End of the World” stamp. From there, you walk into the town and decide what to do. 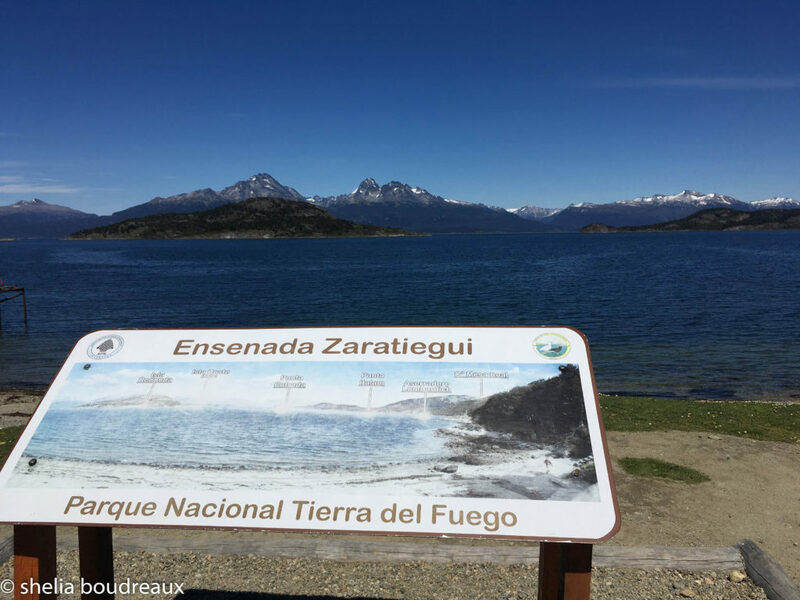 There are many options and we could have just hung around the city had we not been in Tierra del Fuego! We hired a cab to take us to to take us up to the park and it was the best option for us. We got out there before any of the buses, so we were alone in most of our stops. The final stop was an overlook and there were tons of buses. So many that at some point our driver told us to walk through the field of grass and he’d meet us later around the corner. So, yes, I walked through the field. With the geese and their poop. But the view was worth it! After returning we found a nice pub that served local beer. Get off the ship and you will see a ton of taxis. Get one to take you up to Tierra Del Fugo. Negotiate in amount of time spent. Ours we made four stops, which was basically what all of the private tours were doing too. Granted the private tours gave you a run down on what was in each area, but when you enter the park they will give you brochures. Once you finish with your cab, have him drop you off somewhere to eat. Make sure you take into account the time as we finished our ride around 2pm and places were closing at 3. Go over to Cafe Banana and have some local Patagonia brew. The place is friendly and I could have stayed there all day. Lots of information available about Antarctica. In Ushuia you can buy all kinds of things! 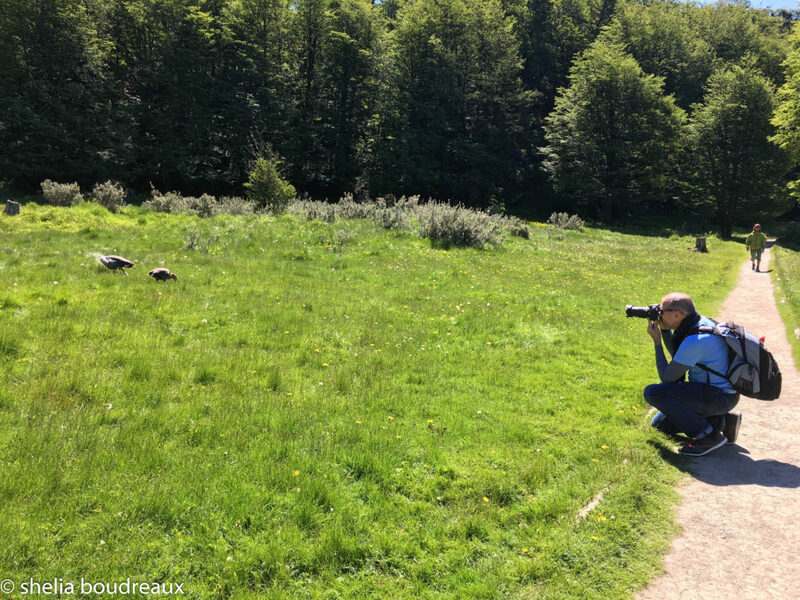 What do you do when in a field of geese in Tierra Del Fuego National Park? You take photos!! This is considered the “End of the Earth” and you can purchase specific stamps, books, etc in this guy’s shop. Cape Horn, or Cabo de Hornos, is named after the city of Hoorn in the Netherlands. Yep, the Netherlands. 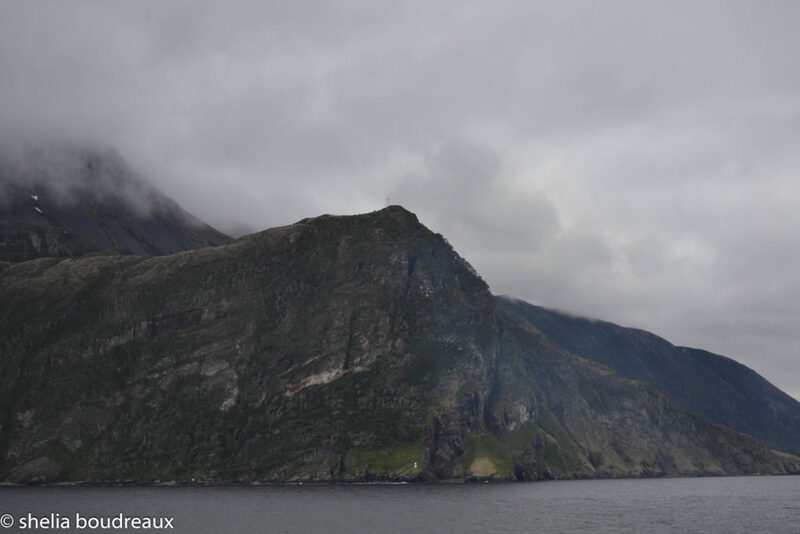 The cruising around Cape Horn is really something to experience. The Cape is where the Drake Passage (Antartic Route), the Pacific and Atlantic waters collide. There were many sailor traditions such as you could wear a gold earring as you passed the cape, and passing around both sides meant you could put your feet on the table during dinner. The ship had a tradition to pour “holy water” of all three seas on the passengers. People lined up to have the water was poured on them. The ice, cold water. We declined and stayed warm. The main reason I wanted to do this cruise was for Stanley. I will have a dedicated write up about it as there was so much information. It took the captain three hours to anchor (we found out later we never actually anchored). Many private tours were cancelled. NCL rescheduled our tour so we were still able to go with plenty of time. People that went alone saw penguins.. from a distance. The people that run Lagoon Bluff were awesome. Our driver was fabulous. The penguins were incredible. My Activity Recommendation: Hands down do Bluff Cove Lagoon Penguin Tour. You can only get there via your cruise, so do not fall for any private tours. This is the main road in Stanley. Road in Stanley. So peaceful nothingness. 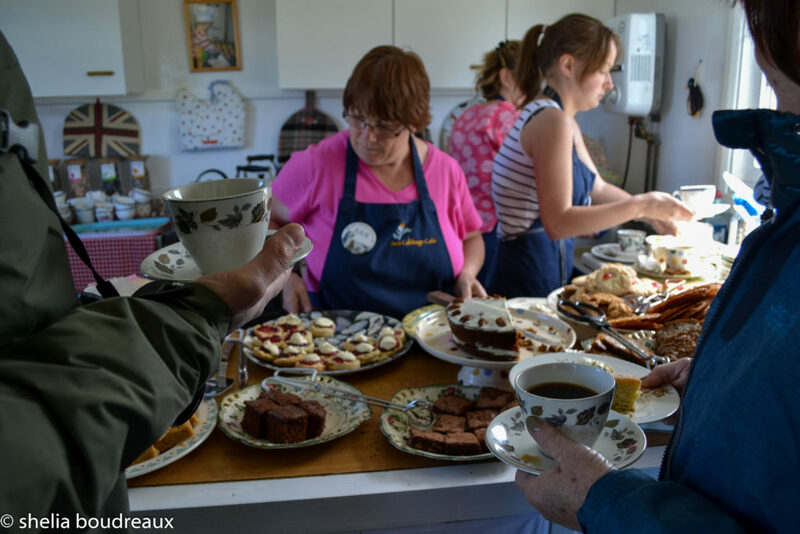 At the Sea Cabbage Cafe, they have a delight of pastries. Don’t try to ask for just one, she wasn’t having any of that! I think we tried one of everything and it was delish!! 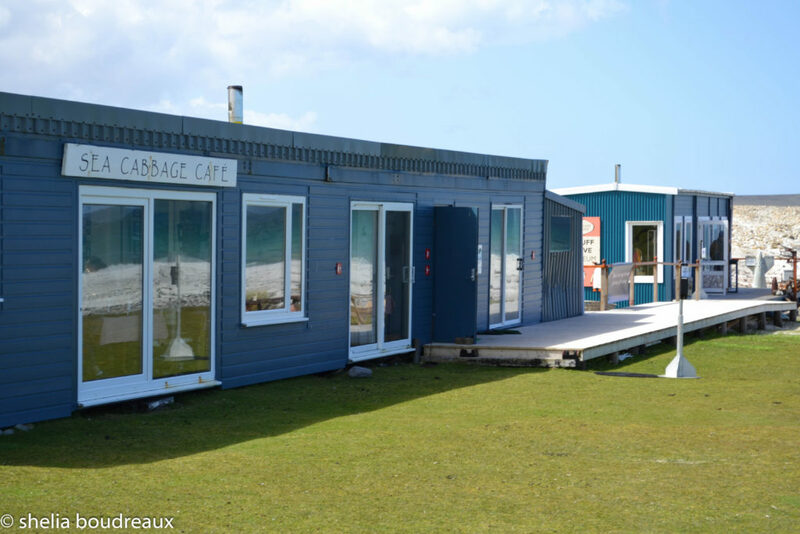 Sea Cabbage Cafe and shop. We got some great take aways in the shop. 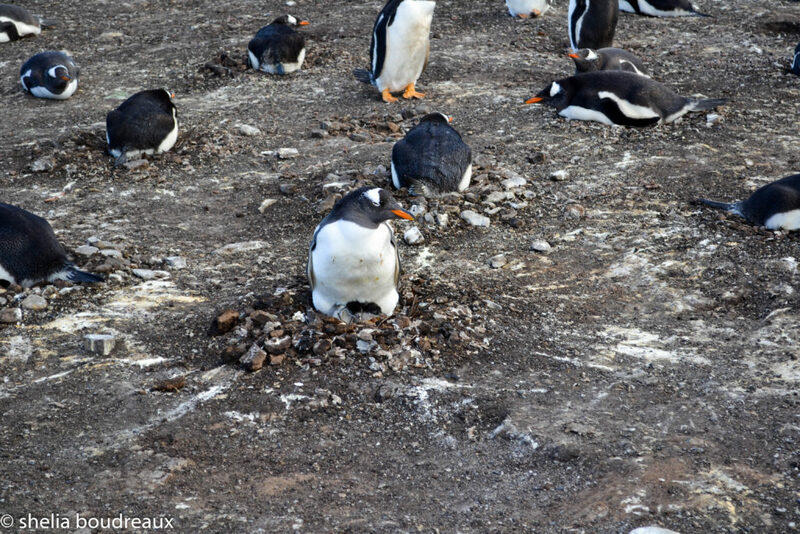 Gentoo Penguin warming up its chicks! You can see on this tour, you can get quite close to the penguins. 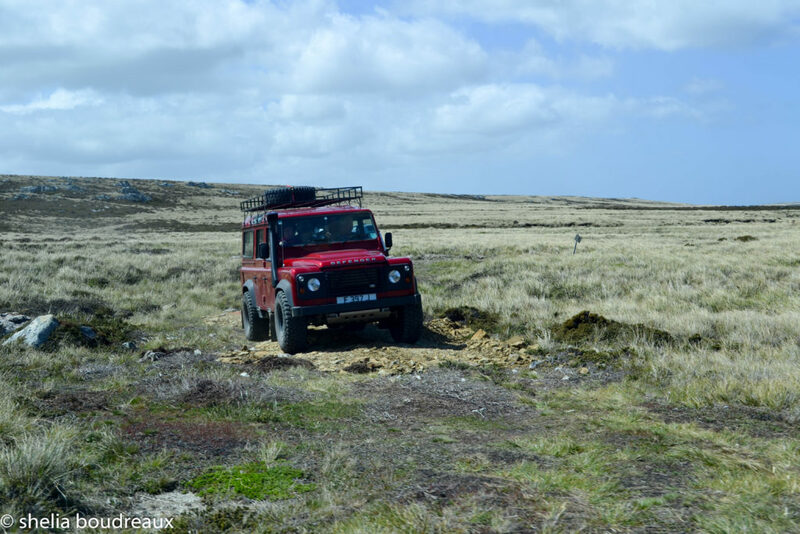 When you go to Bluff Cove, you must take a 4×4 to the penguins. It was a great ride! 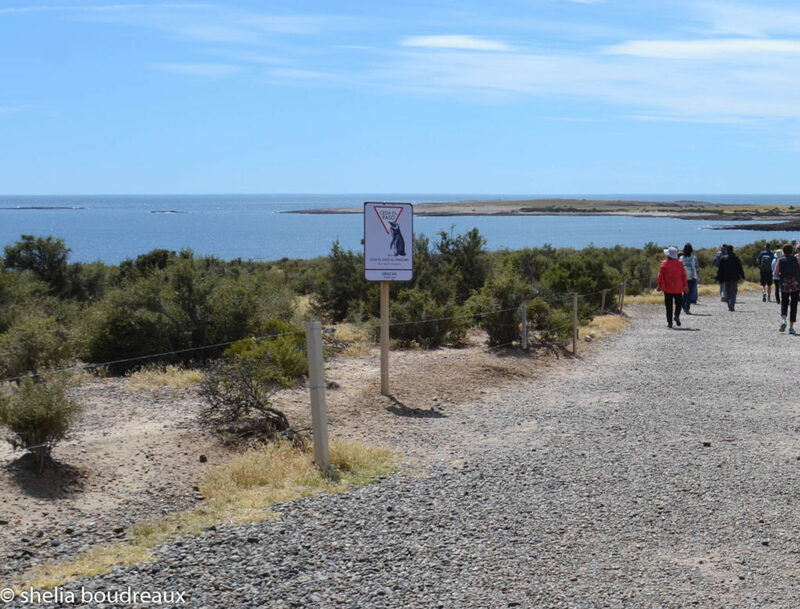 Puerto Madryn is home to the largest Penguin Rookery, Punta Tombo. 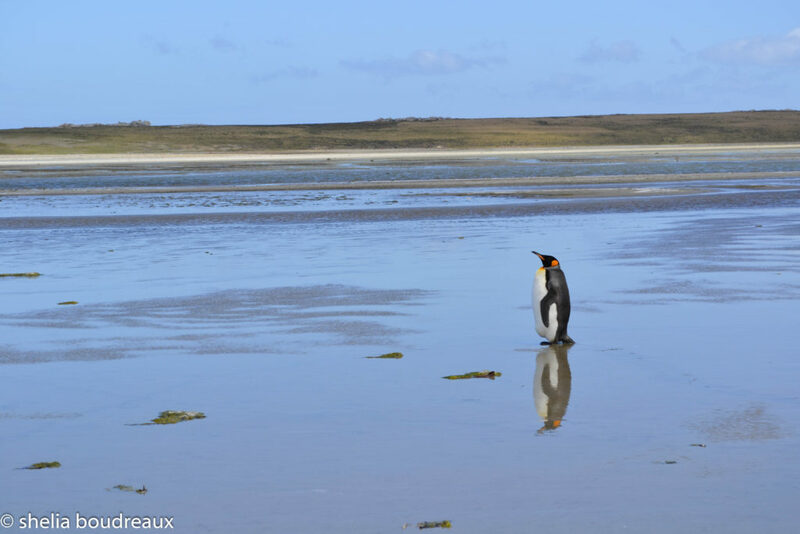 Given we had just had an incredible experience with the penguins in the Falklands, I was hesitant to go to the rookery to see more. But I am glad we did because the experiences are vastly different. 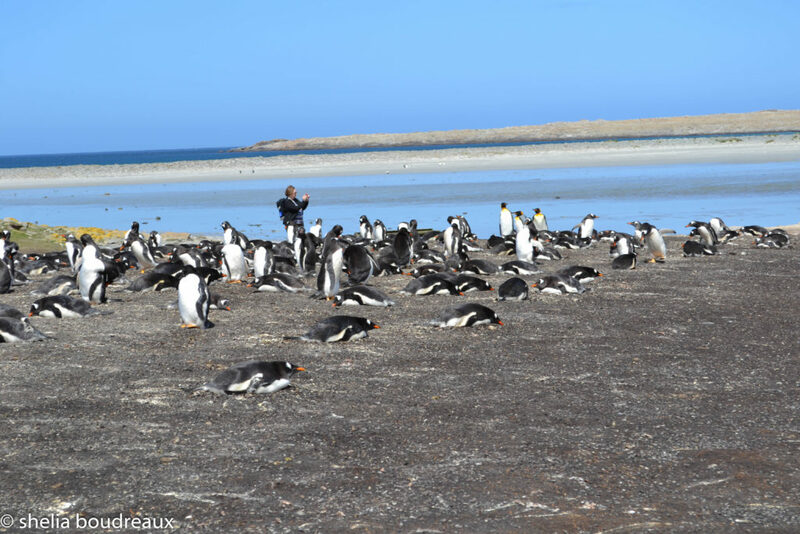 The Falklands was freezing and the penguins were clustered together. 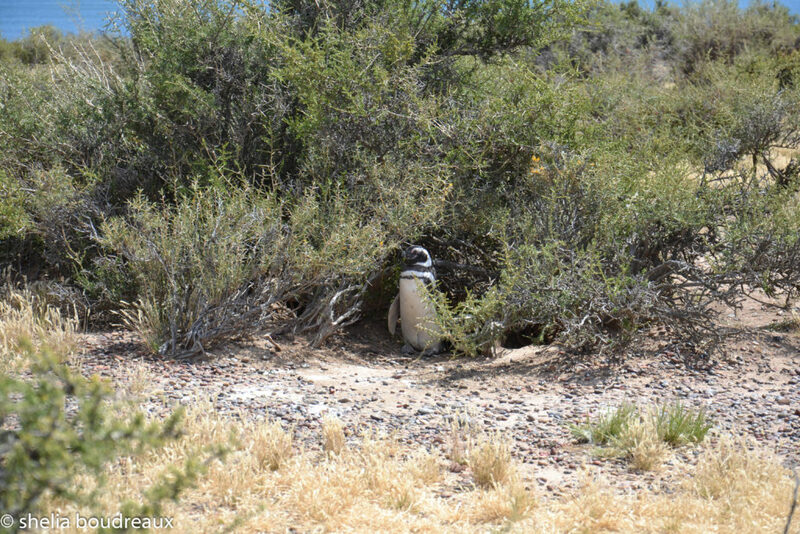 Punta Tombo was very hot and the penguins were scattered like squirrels at the park! 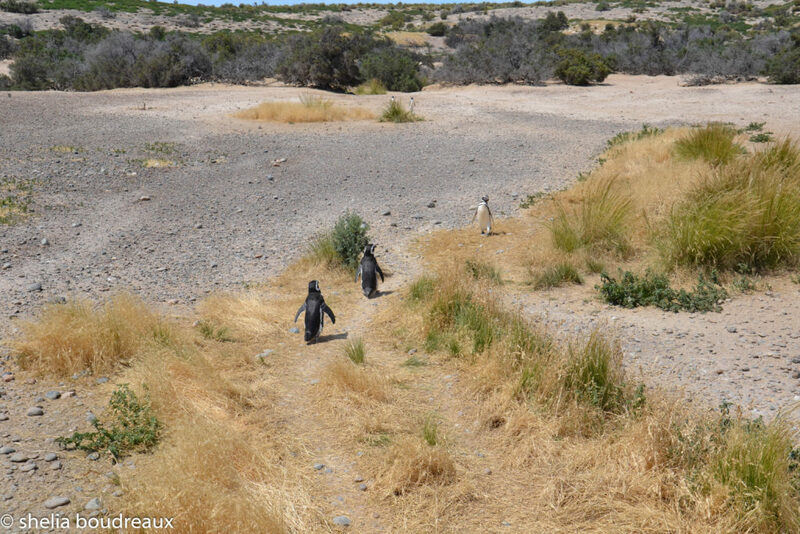 My recommendation: If you want to see penguins, the tour to Punta Tombo is worth the trip. Given it is a two hour ride there and back, we decided to stay with NCL tours just to be safe. Others went on their own and did not have a problem but we really liked our guide on the NCL tour. 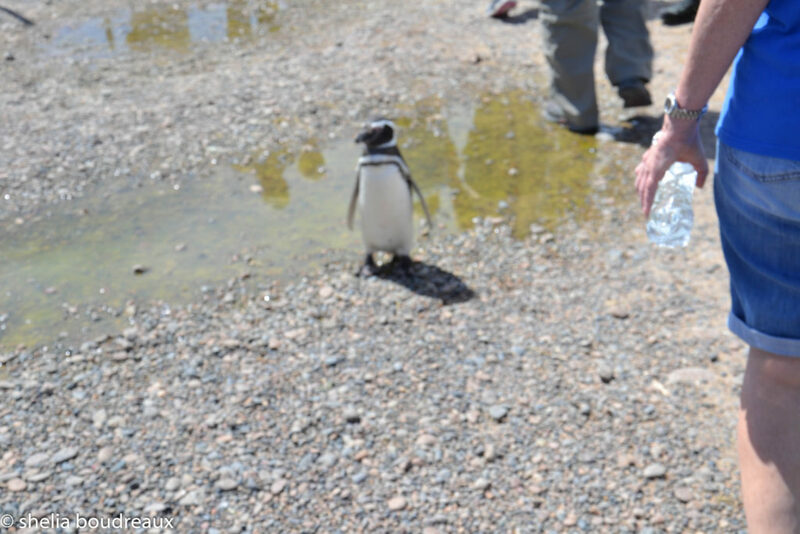 The Penguins would walk in the pathway with you, sometimes stopping to get a closer look at the visitors. When you think of penguins, you think of ice, not bushes right? Penguin Crossing! Don’t touch them or they will bite! Montevideo is a typical South American city. There is the port, the square, with the Cathedral and an avenue of shopping. I felt so at home in Montevideo and yet there was nothing really to do. We did not need to go shopping, and we were not interested in crafts. So, we found a place to sit outside and people watched. The Uruguayans are known for very large sandwiches. 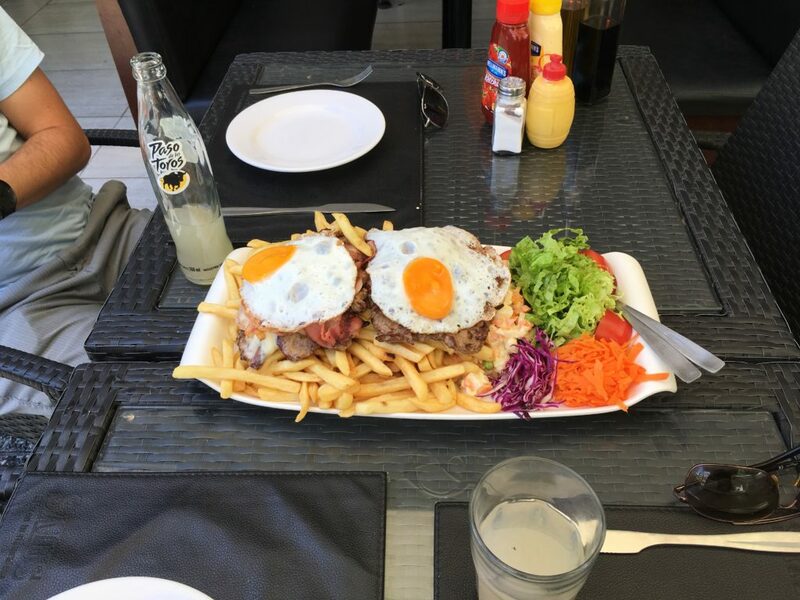 Ridiculous amounts of ham, cheese, egg, fries. We did not dare have one, but they looked yummy. My recommendation: Walk around the city and explore on your own. The cathedral is worth a visit. On your way back, stop off at the market near the port that is full of restaurants. Food is being cooked on a grill in front of you and it is delish! I enjoyed Buenos Aires a great deal and wish we would have stayed more than one day there. We were able to hit the highlights of the city and enjoy some tango on our last night in South America. The trip was a success. 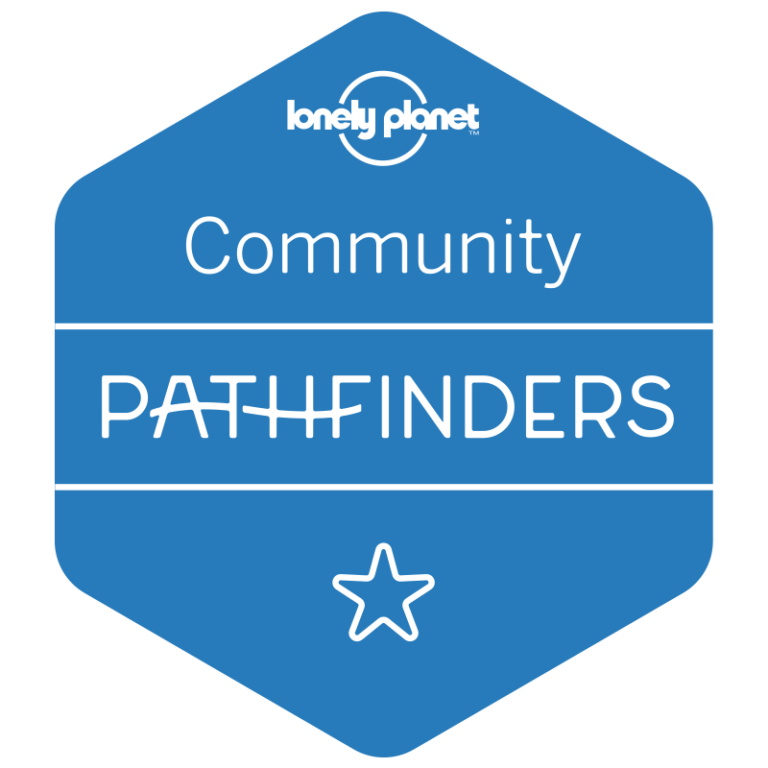 I would highly recommend this itinerary to anyone who loves nature, adventure or wants some peace and relaxation. I will write up more about the ship itself in another post. If you want to add your thoughts please do so in the comments below. 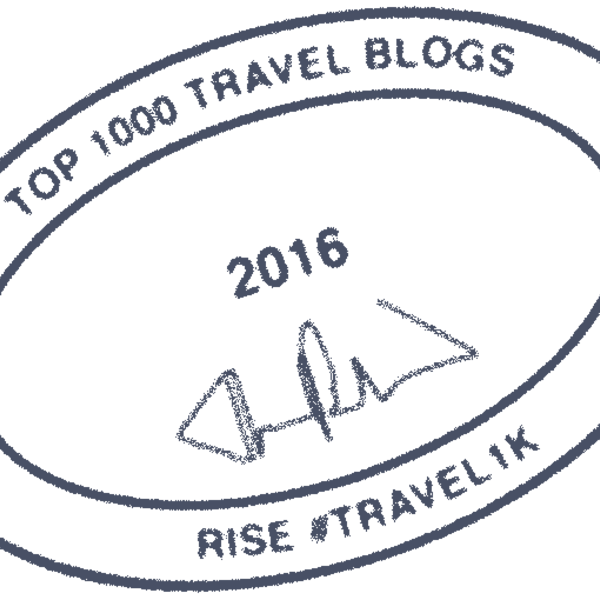 For other cruises read more here: Spain and Alaska. South America is indeed a great travelling location.Bolivia, Ecuador and Peru have a lot of places of tourist interest which offer great scenic landscapes and trekking trails.. All of them are great spots for travelers interested in reveling in the beauty of nature. I couldn’t agree more. It is such an amazing place to get lost in and trek around.